The hype of Web 2.0 can irritate or inspire. As information professionals we have a responsibility to discover and explore the opportunities for better delivery of school library services using new and emerging technologies. This presentation will provide an overview of options available and how the technologies are currently being used in the school library environment. 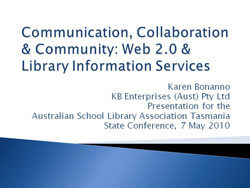 My thanks to colleagues who provided samples of work from their school libraries to include in this presentation. To download the PDF file of the presentation, click on the image below.